Simple and rugged, our nylon collars are a nice compliment to get you dirty compliments. We use only premium materials; our harnesses are made from nylon with metal rivets and rings. They are completely body safe. 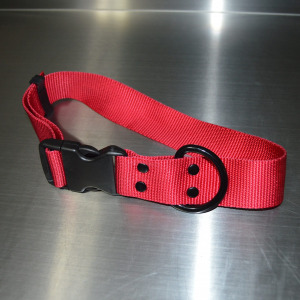 For harnesses, color options are limited to stock colors. Note that these colors vary over time, so nylon products purchased at one time may not be a perfect color match to nylon products purchased at a different time. Will your harness fit me? Do you need measurements or size match? We designed our harnesses to fit most body shapes and sizes and to be very adjustable.